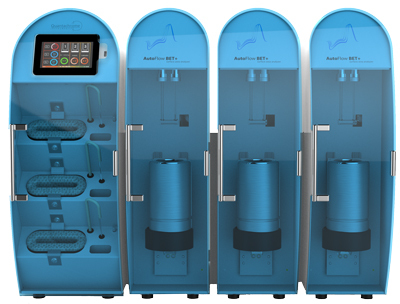 The AutoFlow BET+ is a fully automated state-of-the-art dynamic flow system designed to enable an extremely rapid evaluation of the surface areas of solid samples. Single-point or multi-point determination of surface areas using different standard methods (such as BET and STSA) is easily carried out without the need for measuring system void volumes or recalibrating signal responses. The instrument consists of one control module and one, two, or three independent analysis stations. The control module features a touchscreen and houses three built-in sample preparation stations. Pure gas inputs (nitrogen or krypton as adsorbates and helium as carrier) or, optionally, premixed gases, are automatically mixed to the desired target concentrations using built-in mass flow controllers. The system includes novel MEMS-TCD sensors and all standard accessories needed for its operation. Surface areas between 0.1 and >3,000 m2/g. Surface areas as low as 0.05 m2 in cell with Kr. Isotherm data between 0.005 and 0.95 P/Po. Maximun degas temp. 350° C (450° C optional).